Sanchita Balachandran is the Associate Director of the Johns Hopkins Archaeological Museum and Senior Lecturer in the Department of Near Eastern Studies. She teaches courses related to the identification and analysis of ancient manufacturing techniques of objects, as well as the history, ethics and practice of museum conservation. –Gisela Richter, The Craft of Athenian Pottery. New Haven: Yale University Press, 1923: xi. Pounding clay with a mallet, Baltimore Clayworks, January 2015. Sanchita Balachandran and Matthew Hyleck. Thus begins the preface to famed scholar and curator Gisela Richter’s 1923 book which traces her experience learning to make ceramics at the New York State School of Ceramics in Alfred, New York. She took on an apprenticeship of sorts in an effort to understand how the vases produced in ancient Athens thousands of years before might have been made. Though written 92 years ago, Richter’s desire to understand exactly how these iconic vessels were manufactured mirrors the work of scholars even today. And the question of “how did they do that?” befuddles the public as well. Even the most unseasoned museum goer recognizes the strikingly glossly black vessels with delicately painted red figures and perhaps admires their elegant shapes and proportions. And to anyone pausing for more than a cursory look, the question of how these objects physically came to be isn’t easily grasped. How exactly did the ancient Greek potters and painters do this? For the past four years, I have had the absolute pleasure and privilege of working with students and faculty at the Johns Hopkins Archaeological Museum. Because of my own interest in ancient manufacturing technologies, I have always introduced my students to what always struck me as the utter magic of how Greek black and red figure pottery was made. And we are fortunate to have a wonderful collection of objects to study. My usual description of how they were created is straightforward—the vessels were thrown, slipped, fired (through oxidation, reduction, and oxidation phases)—and out of the kiln came a perfectly formed vase. But anyone who has made anything, even a pinch pot out of Playdoh, knows that there is a plan, and then there is reality, and usually many, many twists and turns between the original intention and the final outcome. This course grew out of a desire to see the process of recreating red-figure pottery through its many phases, and to gain an appreciation for just how complicated these phases are, and how many decisions—big and small—must be made along the way. It also became clear, to follow on Richter’s words, that there were numerous sources available to help on this quest, but that they needed to be brought together. Certainly, there are the many thoughtful and detailed works of art historians and archaeologists and a dauntingly large literature on Greek vases. But the voice, and more importantly, the hands of the potter were essential. And so too were the different kinds of scientific analyses and observations published more recently by art conservators and materials scientists. The hope then was that by bringing all of these disciplines and specialists together, one might approach a little more closely the elusive reality of the master potter and painter working in ancient Greece. But one key element was missing—the apprentice. Who else would be willing to slog for long hours, watching the master potter, learning the most basic of skills and making the observations and gaining the judgment (however limited it is in 13 weeks of work), but an apprentice in workshop. Or better yet, 14 apprentices (actually 16 when I count myself and my teaching assistant Ross Brendle)? This course relies on the participation, enthusiasm, skills, drive and careful work of a group of undergraduate students here at Johns Hopkins. They are chosen from fields as diverse as archaeology, studio art, art history, classics, and materials science, and I hope in the next 13 weeks, they will grow together, asking different questions, learning with their hands, and perhaps even managing to produce a fired kylix or two. This course would not be possible without the generous support of Dr. Elizabeth Rodini of the Programs in Museums and Society at Hopkins and the Andrew W. Mellon Foundation. 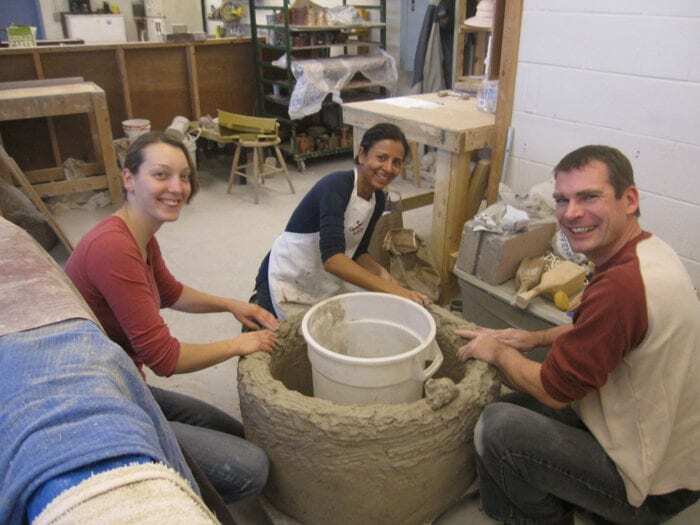 Their support and encouragement has allowed us to collaborate with the brilliant and talented Matthew Hyleck, potter and Education Coordinator of Baltimore Clayworks, an inspiring educational ceramics non-profit here in the city. Funding has also made it possible for us to make a short documentary of our discoveries—both big and small—over the course of the semester. There are many individuals who gave so freely of their expertise, time and advice on this project, and they are listed here in a long and still growing list. 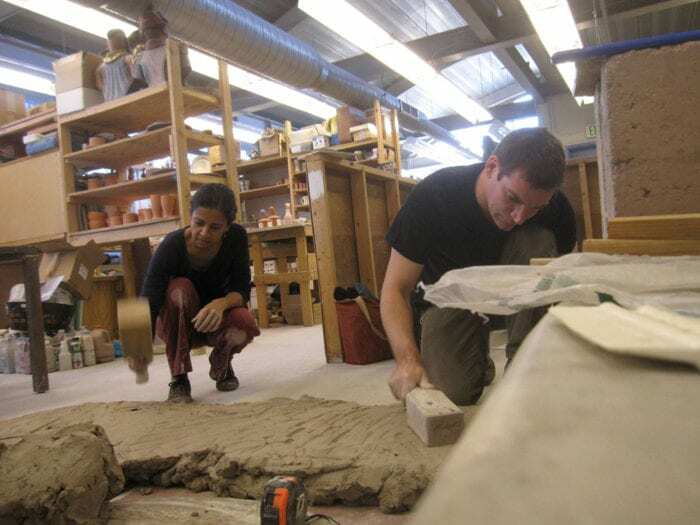 This course has been in planning for nearly a year, and now it is time to apprentice ourselves to the master potters, both ancient and contemporary. Working as an archaeologist in American Historical Archaeology, I too was fascinated by the recovered ceramic hardss, but is was not until I retired and began working with Maryland prehistoric ceramics that I too asked that question. “how did they do it?” I have been trying to answer that question for about five years by taking various ceramic courses and workshops. The prehistoric people in Maryland did not have the wheel. So I hand build and model, using the coiling method, as I try to answer “the question” with some success. The “take away” from my experiences: do not expect immediate success, but keep at it. Working with clay can be addictive! Good luck with your research.